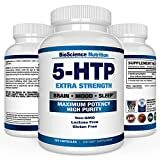 The human body manufactures 5-HTP from L-Tryptophan, a natural amino acid found in most dietary proteins. However, eating food that contains L-tryptophan does not significantly increase 5-HTP levels. The use of 5-HTP for dogs is controversial, and potentially very dangerous. A study at the Tufts University School of Medicine found that 1 mg per pound of dog weight twice a day, was beneficial in reducing canine aggression. However, an analysis of accidental 5-HTP ingestion by dogs found that a dose of as little as 10 mg per pound of dog weight could be toxic and produce serotonin syndrome.